There's a rollicking discussion of ad schools over on G. Parker's Madscam blog. But browsing about Adpulp, another favorite blog, I found the ad you see above. $650,000 a month is a lot of scratch. I mean that's around $22,000/day on a 5-day week. Now who is this Clayton Makepeace? Well just Google his name and you'll find he's done his SEO and SEM homework. He's got every hit on the first page plus every paid link on the right-hand side. He's got a number of businesses, all of which promise to make you an incredibly rich copywriter like "copywriting legend Gary Bencivenga"
Maybe you’ve invested some time and money into learning “salesmanship in print” through one of the excellent books and courses offered by American Writers & Artists Institute and others. Not sure about you all, but I'm guessing the American Writers & Artists Institute is not a direct competitor of VCU BrandCenter or Miami Ad School. But that's the rub. 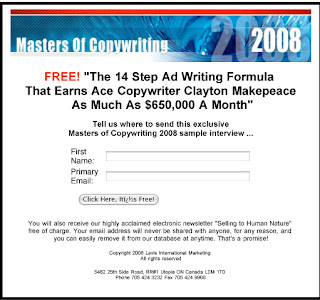 I'm sure Clayton Makepeace does make a boatload of money. As does Gary Bencivenga. There's a whole world of agencies and creatives out there - DM, medical, classified, who are in the same business we are, but forsook the glamor for the cash and are raking it in. When you achieve the level of Master of Copywriting, does that mean your words can kill? The first two ad copywriting schools were, I think, The Famous Writers School in Westport Connecticut and The Bill Casey Copy School. The former featured John Caples + other writers from various writing fields. For some reason I can only remember the name Mignon G Eberhart, but it is possible non-fiction star Martin Mayer also lent his name. Possibly Rod Serling too, from The Twilight Zone. The second was the brainchild of a DDB copywriter who did a lot of Polaroid with Helmut Krone. He ran a small space ad in The Times promising that "you could make $15,000 annually in three years if you have what it takes." It really was less a school than Casey's apartment. This was 1968 so it is a good lesson in the ravages of inflation. analysis and the lecture plus he got some assistant AD's from DDB to come in and work with people on their portfolios. The course tuition was $300, payable in three installments. Half the people dropped out, I was told. That ad schools have become an industry is interesting on several levels, but the "networking" aspect might be the practical use. Like MBA programs and MFA and all the rest in which alumni seek to hire fellow alumni. These days, I am also told, the makeshift copy portfolio--no matter what the ideas--is dismissed in favor of the well-designed and put together book. Gone are the days when someone looking for a job could get some presstype and, if a page was blank in the portfolio, the writer could take the gum from his mouth, stick it on the page...and write a headline: "0.mg tar. 0.mg. nicotine." And fill the book. It says FREE as the lead in - got to get them interested. It has a 14-step program, so the consumer knows what they are getting. And it gives a dollar figure that you could earn from it - the what's in it for me. Who cares about branding, this thing will drive measurable results on a CPM basis. I hate people who say stuff like the above. sorry...got my blogs mixed up...thought i was on huffington.. Reminds me of the picture of David Ogilvy's castle/estate in "Ogilvy on Advertising." I believe the caption was something like "An aspiring copywriter who works hard could someday own such an estate..." or some crap like that. @ messner: you just made me cringe and remember junior high school! I so totally thought I was going to be rich and glamorous. Didn't happen. I don't even know where can one get the two together nowadays, apart from if you succeed in doing something genuinely creative, like music or writing or art. Scamp... You can only be rich and glamorous if you are Julie Roehm. Oh, wait a minute, she WAS rich and glamorous, she was also a change agent, rock star. Maybe she could now become a "Master of Copywriting" and then, as MTLB says, kill me with her words. And Tom... You have to stop reading the Huffington Post, it's not doing you any good. Robert Bly tried to convince me to shuck the branding jive and do it his way. Yes, these guys may make money, but I would argue they are doing it in a far different way (and probably generating far more work than most of us, in terms of volume). But at the end of the day, how much of the stuff is a source of personal pride? Not to diss these guys. They certainly have specialized talent and are to be commended for their entrepreneurial zest. But this DIY copywriting is almost insulting. And surfing the Web displays the end results of the students (i.e., the really badly written sites and ads). Despite the hype, these guys may be indirectly responsible for the worst and most ineffective stuff out there. Also, if the man is really making $650,000 per month, there is something very wrong with the universe. I think he’s actually taking advantage of not being hampered by a legal department. Perhaps a quick call to the IRS could help him prove that income claim? Note to self: If I'm ever self-employed and pulling down $650K a month, don't brag about it in public. Hey guys- thanks for all the great commentary on here. @HJ & FATC: I was skeptical about the $650K/month thing too, though I suspect that he made that amount once, and it probably involved a few lump payments that all landed in his mailbox at around the same time. @DB & db: I suspect branding doesn't figure much into the products these guys advertise, which seem to be mostly mail-order (or internet-order) products like nutritional supplements, collector's edition plates, how-to DVDs and the like. None of which need anything resembling branding as the goal is to sell the manufacturing run and move on to the next item. Hi Nice Blog .So as you develop your link strategies, it is important to link to a few high-ranking sites for your keywords. This helps Google know where to group you in the search engines. At least in my own limited experience linking to related blogs and websites is very beneficial. I have made it an important part of both my seo schooland my Link Building Strategy.